A weekly certified payroll form is a type of a form which helps in maintaining the work of an employee involved in a project. There are various things that get highlighted in this document. Starting from the name of the employee, then the classification of work done, hours worked each day or over a week, the total fringe rate, total deduction and the gross pay. This entire document maintains the complete working history of an employee on a weekly basis. This particular form also maintains the working history of the employee. This particular form consists of two parts. The first part is the prevailing payroll information and the next is the statement of compliance. In the first part there is basic information about the contractor of a particular project and then the form highlights in detail the various activities of an employee. Starting from the name, address and indentifying number, it has got detailed information of an employee working in a project. This particular document is used to maintain the payroll of the labourers working in various projects under a contractor. The contractor with the help of this document maintains the wages of each and every worker. This document consists of a detail working history like days and hour of work, classification of work, the gross amount, and deductions of taxes if any. In this way the document clearly mentions each and every factor which is needed to be maintained as a part of working history. This particular form is used to maintain the payroll of the workers working under the government. Even this form contains the detailed information about the employee and also the contractor who has been given the contract of doing a project. In the first part of the form the details of the contractor is given and in the next part the working details of an employee is broadly highlighted. Each and every aspect of working like wages, salary, taxes, and deductions are filled in details. A certified transcript payroll is a type of a document which helps in maintaining the payroll accounts of a worker. Along with the information of the contractor and subcontractor this particular payroll form includes the various details of the work information of an employee. Starting from the wages, pension, tax deductions, and hours of work. Like this all the details are filled in this specific form. This is the only certified legal document which helps to maintain the employees’ account. 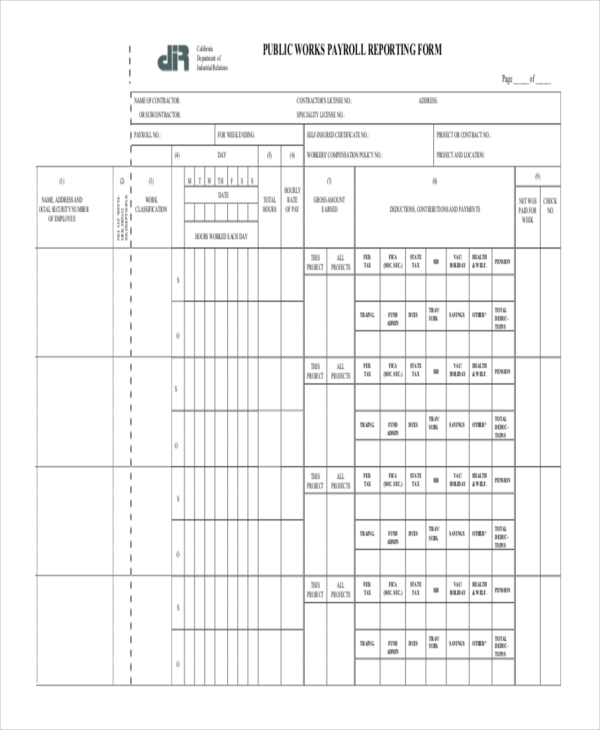 This form is mainly used to maintain the working details of a worker. 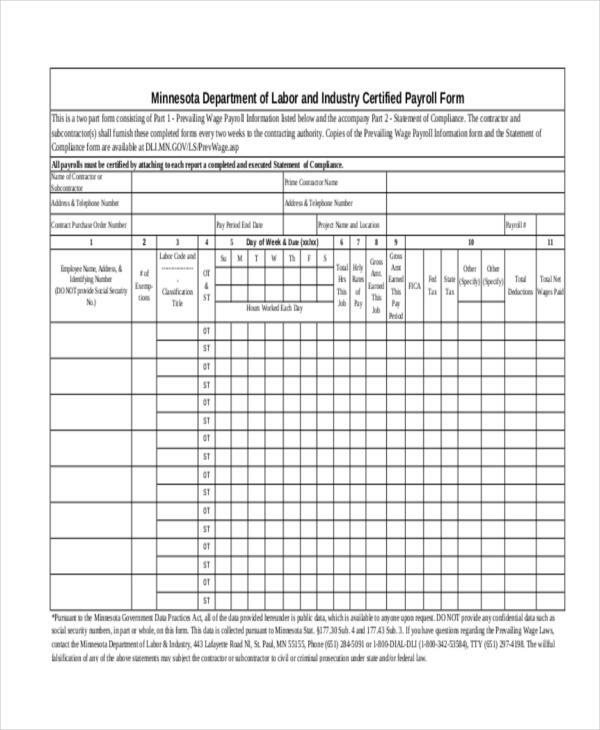 The payroll notification information is maintained in this form. All the working details of the workers involved in various projects are filled in details to maintain a payroll account. The various details are like the identity of the workers, type of projects, start and end date of the project, total hours of work etc. All these information keeps a track of the amount spent on the workers. A certified payroll report is a type of a report which is used to maintain the working details of a worker. This particular report consists of information about a worker related to his working. The entire working statistics is there in this report. Based on this document the payroll is calculated. What is a Certified Payroll Form? Every organization be it a public one or a private one maintains the working history of each and every worker in an organized way. In the working history, comes the payroll element which is considered to be the amount spent on every employee over a period of time. A certified payroll form is a category of a form which essentially consists of details of a worker working in a project. At first the basic information is highlighted about a worker and then the form consist of working hours, type of work, wage amount, tax deductions and like this there are many information which the form keeps a track. This form helps in maintaining the workers payroll details in a much better way. The tracking of information works best with this particular form. Before the introduction of this form, there was no other way to keep a track of the payroll information. 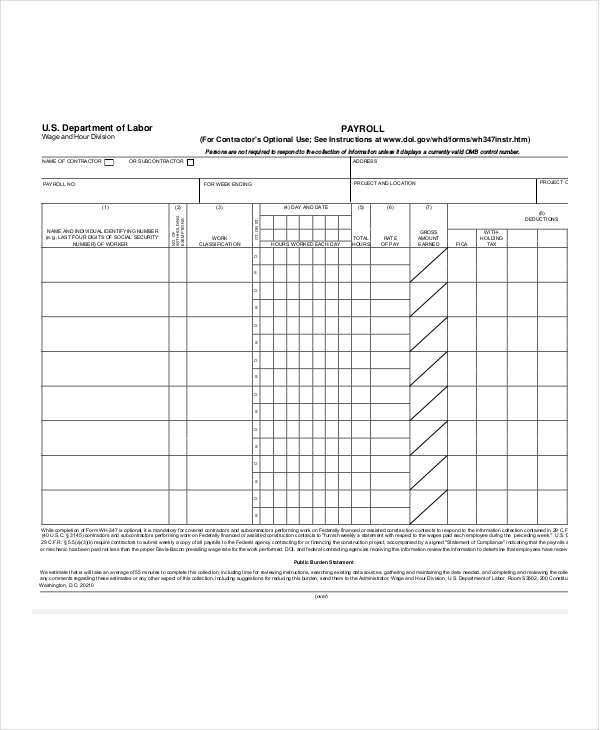 Now every organization uses this form in order to get the details of the payment made to a worker over a period of time. This acts as the only legal document for maintaining the payroll accounts. The target group of this particular form as said earlier is huge and is also much diversified. There are various categories of workers who work in a project and this form is used for every worker in maintaining their accounts. This particular form has a huge purpose to solve. 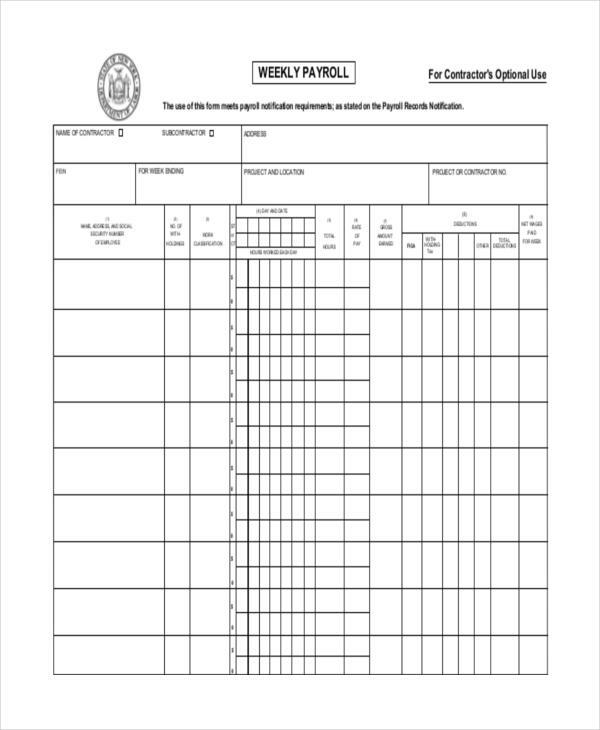 All information of a worker’s payroll gets highlighted in this form. The payroll information helps an organization to maintain a proper account of the money spent on salaries and incentives of the workers. A certified payroll form is a legal document which consists of every details of a worker working under a project. The organization keeps a track of various elements like salary, working hours, tax deductions through this particular form. In the recent times this form has been widely accepted by various institutions. 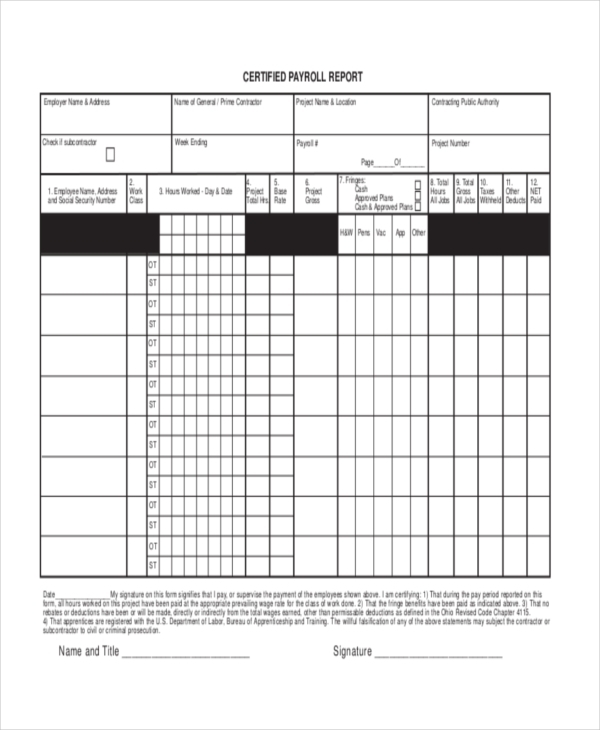 A certified payroll form is available in both word and PDF format in our website. All these forms will definitely serve various purposes and is absolutely available in customized sizes. Any individual who need this particular form can simply download it and can edit it as per the requirement. The templates of various forms are quite popular among the customers. There is a huge download of forms by people which has helped them over the years to solve various purposes. The market has a great demand for our forms. The company truly believes that the forms which are available in the website will actually solve the purpose of each and every person. It is highly recommended to place your views on our working. All the views and ideas will be highly appreciated. A certified payroll form is indeed a document which solves the best purpose in maintaining the account of a worker. Every details of a worker are clearly highlighted in this form. Starting from the basic information till the salary amount and incentives, everything is duly notified in this form. 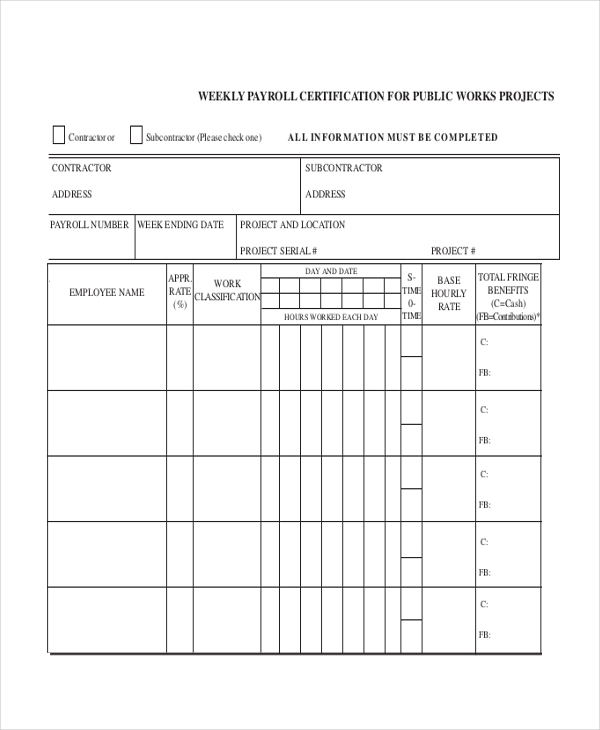 An organization keeps a track of the worker’s payroll by the assistance of this form. The various companies always keep track of the payroll information. This form helps the company to maintain the payroll account in a much better and regulated way.